In his first season with the discus, Sam Welsh placed fifth overall at the 2017 New Balance Nationals. Sam Welsh has high expectations this weekend, and for good reason. 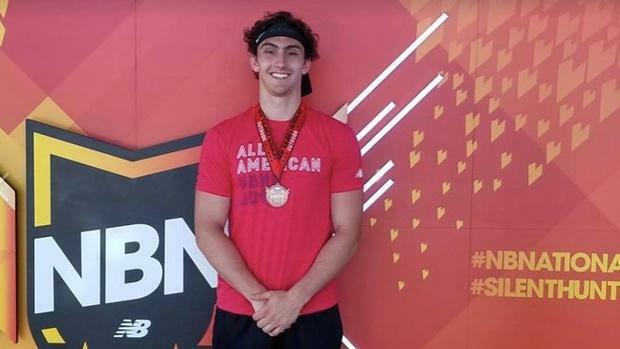 This weekend, the Concord Academy senior will be traveling to North Carolina for the New Balance Nationals Outdoor (NBNO) Championships where he has a legitimate shot to earn his first individual title. Welsh goes into the meet as the No. 1 seed based on his personal-best heave of 212 feet from the NEPSTA Division 3 Championships on May 19. With that toss, he passed the previous nation-leader Patrick Larrison of Oklahoma's Moore High, who has a best of 210-9. Welsh and Larrison, along with Georgia's Tanner Duffin (203-8), the only other athlete to exceed 200 feet, will all be competing at NBNO. The Finals are slated for 2 p.m., on Sunday. We caught up with Welsh this week to ask him a few questions about the upcoming nationals and his talented competitors. MileSplit MA: Your last meet was the Division III meet back on May 19. How has your training been going since then? What have you been doing to stay sharp and mentally prepared for NBNO? Sam: My training has been going well and I've been practicing hard. I am focusing on explosive exercises in the weight room and I am feeling very strong. Visualization has played a big part in my training and is helping me to be more consistent with my throws. MileSplit MA: You earned All-American status last year by finishing fifth overall. My guess is it's a slightly different feeling going into the meet this year, and a different mindset considering you are the No. 1 seed and could potentially earn your first national title. What's your thoughts? Sam: It's an awesome feeling and it's very exciting to think that a national title could be a possibility. I'm working hard at staying focused on my training and preparing mentally to give my best effort. MileSplit MA: In your two previous meets this season where you surpassed the 200-foot mark, your closest competitor was nearly 100 feet behind. This weekend, the potential is there for three (or more) competitors achieving 200 feet with the winner being determined by a few feet or possibly inches. How have you been preparing yourself mentally for this? What do you feel you need to do to get yourself ready for the possibility of some stiff competition? How important do you feel that first throw will be inside the circle? How far do you think you can throw this weekend? Do you feel a 220-foot effort is possible? Sam: I don't think of it any different than last year because all I need to focus on is myself and how I can achieve my best mark. I really enjoy being around other high caliber throwers because it motivates me to do better. As far as distance, I can only hope to throw as far as possible. I definitely think I am capable of throwing 220 and if I were able to do it in a big competition like this, I would be thrilled. I love being in intense competitions with great athletes and I can't wait to be back this weekend. MileSplit MA: Your first competition in the discus was last year when you tossed a school record of 183-4. Now, a little over a year later, you are one of the favorites for a national title. Talk about that rapid rise to the elite level and what it would feel like to stand on top of that podium as a national champion? Sam: I've loved throwing the discus since the first day I picked it up and the challenge of getting better has greatly motivated me. I believe that I've been able to improve so quickly because I've loved every second of my training, especially when it gets tough. My greatest improvements have come when I'm having a difficult practice and I'm able to grind through it and turn things around. If I'm able to become a national champion, it would be an honor. WATCH Welsh's 212 effort from the NEPSTA Division III Invitational below.